Blyth Spartans slipped to a late 2-1 defeat at Boston United on Saturday. The Pilgrims got their noses in front in the 62nd minute when Ashley Hemmings sent Peter Jameson the wrong way from the penalty spot. Alun Armstrong’s men had a penalty shout of their own in the first-half – which referee Martin Woods initially awarded before the linesman overruled the decision. Fourteen minutes after falling behind, Spartans did level through Dan Maguire’s 14th goal of the season when he tapped home from close-range after a cross from Ian Watson. However, Blyth let their point slip with substitute Kabongo Tshimanga capitalising on the loose ball left by Jameson due to a series of ricochets, seven minutes from full-time. Maguire made his first National League North start since the 1-0 home defeat to Salford City on December 2. But his return failed to offer any immediate inspiration for the visitors, who spent the majority of the opening exchanges allowing the Pilgrims to carry possession. 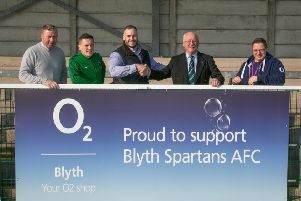 On the half-hour mark, Blyth almost took the lead with Dale Hopson witnessing his goal-bound shot superbly blocked before his second attempt was blazed into the stand. But there was controversy in the 39th minute. Sean Reid fell to ground under the challenge from Pilgrims keeper Jon Stewart – which led to referee Woods pointing to the spot. However, after going over to consult his linesman, the decision was overturned and Blyth had to settle for a corner. Boston then took the lead from the spot in the 61st minute. Nathan Buddle fell victim to bringing down the striker and Hemmings was left to dispatch his spot kick straight down the middle. However, Maguire was on-hand to level the scores in the 76th minute. Watson aimed his cross onto the head of Maguire – the initial effort was directly at Stewart but Maguire stayed alert to tap home the rebound. Boston responded and a shot was cannoned at goal – Jameson could only parry and Tshimanga swept up the loose ball. Unfortunately for the travelling supporters, Spartans were unable to fashion a late equaliser.